Master Champion Royal Majesty’s “ATLAS” of Chateau De Chief. 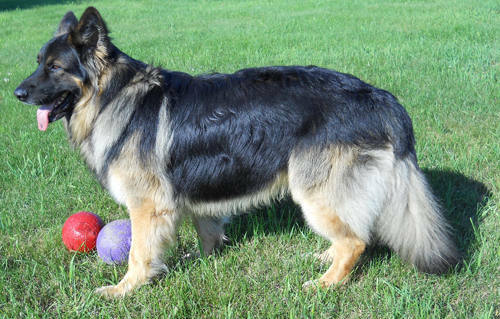 Atlas at the tender age of 11 months became one of the youngest King Shepherds ever to earn 3 Championship titles, He is an ARBA Champion, a North American & Rarities International Champion and an American King Shepherd Champion. He was the 2007 Junior puppy Best in show and Multiple Best in Specialty show winner. He has multiple first places, winner's dog and best of winner's wins, also has Best of Breed wins. As of October 2010 Atlas has received his American Rare Breed Association "Master Champion" title. Atlas has a handsome large head, straight topline and large bone, he tips the scale at 118lbs. He has beautiful flowing movement when he is in the show ring. Outisde the ring when he is at home on the farm Atlas will chase butterflies up and down the field for hours on end, he has a very sweet temperment and is quite a character. Atlas is considered a long haired King and his colorings are black and red. Atlas and Champion Pointed January's Garnet Girl had their first litter in November 2011, at a day shy of 8 weeks of age puppies averaged at 20lbs. They had extremely large bone, beautiful heads and great dispositions. 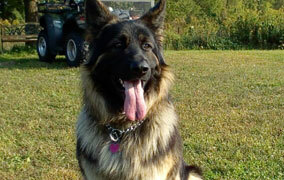 Atlas is available for stud service to any recommended female King shepherd.